NEW YORK, N.Y. – Persistent Systems, LLC (“Persistent”) announced today that it has entered into a five-year partnership with MartinUAV, LLC (“MartinUAV”). 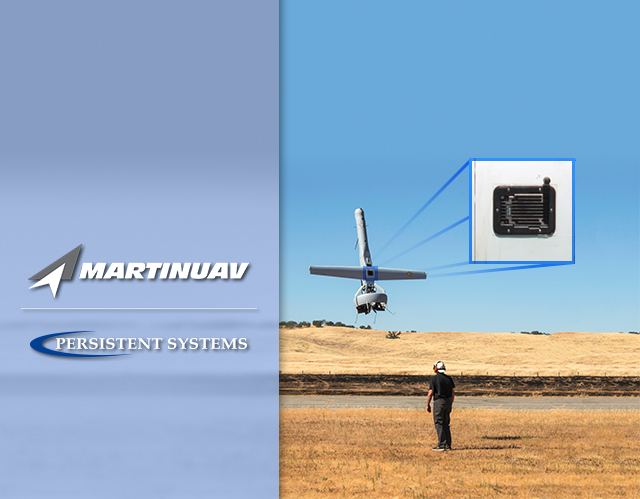 MartinUAV will incorporate Persistent’s Wave Relay® Mobile Ad Hoc Network (MANET) technology into the V-BAT, a small vertical takeoff-and-land (VTOL) unmanned aerial vehicle (UAV). For more information on the Wave Relay® MANET-enabled MartinUAV products, please contact Heath Niemi, MartinUAV’s VP of Sales via email at hniemi@martinuav.com.